After 6 years in the Atkins building, Bailey Punshon accountants have undergone a rebranding and are now known as Bailey & Griffiths. The two directors, Jeanette and Tracey, are excited for the future and are pleased that clients both old and new, have embraced the name change, even though the legal name will remain for a while longer. At Bailey & Griffiths, we aim to offer a complete service focusing on a friendly but professional approach at competitive prices. 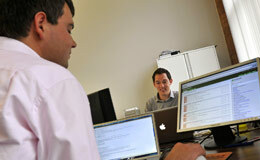 Chartered accountants, services include - annual accounts, self assessment, corporation tax, VAT, bookkeeping and payroll. We have a proactive friendly, jargon free approach at a reasonable price.